You’re going to hear that phrase a lot more over the coming months. It’s a catchy slogan, if I do say so myself. It’s also the god’s honest truth. What it means is simple: Big game critters like Elk, Bighorn Sheep, Mule deer and Rocky Mtn Goats need a lot of room in order to live their lives. They need unbroken habitat, and they need that habitat to be there for generations to come, just as hunters and anglers need robust wildlife populations for future generations. That’s why we’re supporting the Rocky Mountain Front Heritage and thanking Senator Max Baucus for introducing this landmark legislation today. The Rocky Mountain Front Heritage Act is the product of long hours and lots of face to face meetings with folks who weren’t always friendly. The proposal as it sits now is one that respects everyone, and every use on the landscape. No motorized use is lost, and Mtn Bikers have even come on and endorsed this proposal because they see the benefits of the Conservation Management Area in terms of increased opportunity for their sport. Hunters have been guarding jealously the Rocky Mountain Front for over 130 years. From the first fish and game laws, to the Sun River Game Preserve (established in 1913), to the Sun River Game Range in 1948, hunters have been standing up to protect the Front. The additions of the Ear Mtn and Blackleaf game ranges in the late 1970’s and the Roadless Area Conservation Rule all have helped create a place where elk can thrive, and hunters can spend 11 weeks every year chasing them. The Heritage Act keeps things as they are now. While a few minor changes in terms of one Mtn Bike loop would be closed, other activities such as grazing, hunting, angling, firewood gathering, ATV use and hiking would all stay the same. 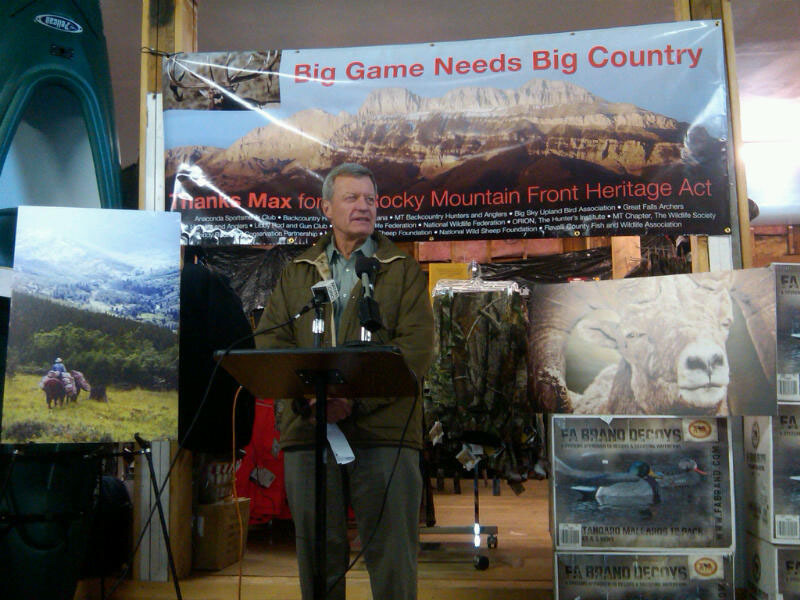 The Rocky Mtn Front Heritage is a hunter specific bill. This effort was led by locals who live and play along the Front. Guys like Stoney Burk and Roy Jacobs. Ranchers like Karl Rappold and Dusty Crary made sure that we took into account the needs of the family ranchers who still run their operations along the majority of the Front. In short, this is a sportsman’s dream come true. Areas that are truly deserving of wilderness are set aside as Wilderness. The rest of the area retains it’s roadless characteristics while keeping Congress’ hands off of the Front. You can find everything you wanted to know about the Rocky Mtn Front Heritage Act here. Thanks Max, we here at the Pulpit are proud to see folks stand up and fight back against the onslaught of anti-hunting and anti-conservation bills coming out of Congress lately. This is a big deal. We get that. We also know that hunters once again will rise up and protect the wild heart of Montana.